Subic﻿ Bay, Philippines. The navy’s Cold War outpost in the western Pacific. The USS Harvey. A bastion of American sea power in the Far East. But Elliott Decker doesn’t give a hoot about all that. He’s been on board ship a year, relishing the laid-back lifestyle of the tropical locale. It’s not just a job, it’s a dream assignment. That is, until a shipmate, Michael Kippen, falls overboard one night and disappears into the South China Sea. The navy rules the death an accident. Decker becomes skeptical when his friend, Vega Magpantay, a rookie with the Olongapo City police, tells him about the Philippine black market for American navy goods. But her hands are tied: the local cops lack jurisdiction over the U.S. military base and her chauvinistic boss doesn’t let her do real police work. Undeterred and with a knack for getting others to do his dirty work, Decker and his wingman, Hack Wilson, undertake the snooping. Suspects are plenty among Harvey crewmembers and an attempt on Decker’s life ups the ante. Guided by Vega, the sailors uncover evidence that takes them across the naval base, through the backstreets of Olongapo, and into the heart of Manila, rife with the People Power Revolution to overthrow Ferdinand Marcos. 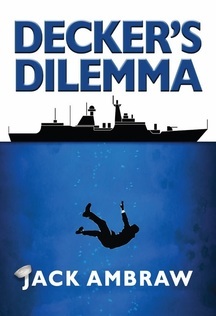 When another murder tosses the sailors into ever more dangerous waters, it’s up to Decker to find the answers and fast. Can't make it to a book signing? Rainy Day Books of Fairway, Kansas will ship autogra﻿﻿﻿﻿p﻿﻿hed co﻿﻿pies of Dilemma worldwide. The book is also available at Amazon and Barnes & Noble in print and e-book editions. "Solid thriller, especially for those who like military dramas. If you were a fan of the TV series JAG, you will probably love this book."